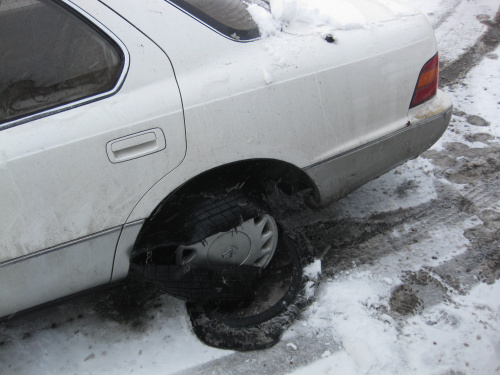 Rock It Til The Wheels Fall Off…Literally! I have an interesting story to share with you and it has to do with a closing that was scheduled for noon a few weeks back. So I am on my way to the closing and usually NEVER stop to pick up my lock box but this time I decided to drop by, grab the box and keys and give it to the seller at closing.It just happened to be snowing that day and the roads were nothing but ice. I hop out of my car, go grab the box and walk around the house to make sure its still in place. I get back in my car, put it in drive and…nothing. I am spinning my wheels in less than 1 inch of snow on a pure sheet of ice. So naturally, I rock it back and forth, move ahead come back, move ahead come back. After about ten minutes of nothing I call my business partner to come get me, Ill deal with the car later. While waiting for him to come from the other side of town I am persistent in getting out. I take my floor mats out and stuff them under my wheels and start at it again. I MADE PROGRESS. I moved about four feet and I am stuck again. Now, I open my door to see whats going on! Whats that hissing sound I hear. AHHHH. Flat tire from a nail in the street. No problem. let it get lower, get more traction, make it to the closing deal with it later. Never happened that way. Now I am downright pissed off. I’m late, my buyer is there, title company is thinking, “Gosh, Erik is here twice a week, hes never late”. So I call to set it straight and return to getting my Lexus unstuck. I redlining my car until my check engine light comes on and still nothing. Finally, once it got low enough I got some traction, got the momentum and just got going. I cal my partner and tell him to pick me up at the corner. Once I get to the corner, I realize he is not here yet. Ill drive to the next corner and tell him to meet there. I get to the corner and just like Forrest Gump says ” I just kept on going”. So I am driving down a main road on about 1 PSI of pressure in my poor Lexus’. Next thing I hear is this unusually loud THUMP. I got passed by my own set of rubber. I look down and I am at 8000 RPMs and not moving. Jeez, I thought, It must be really flat. I cut three lanes over and left my car in an empty parking lot, grabbed my files, got out and ran (in $100 dress shoes mind you) through 18 inches of snow across two highways, down four blocks into my title company. 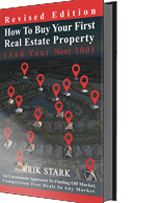 I don’t write this story to brag but a lot of people wonder how you make it in real estate. I ruined my car that day, but to no concern my buyer left the closing table with a $40,000 equity position and I left with $5000 to put in my bank. Until that day I had about 45 minutes into this deal and after it was done I had a total of 1 hour 45 minutes and walked away with a small paycheck. Just a fascinating story about what it takes to get it done in real estate. You rock it until the wheels fall off. literally. Next PostNext What I Learned after 400+ deals.